Will Porterfield finally ended Gloucestershire's century jinx with a career-best 175 out of a total of 324 for 4 on the opening day against Worcestershire at Cheltenham. It was the first ton by any of the county's batsmen in County Championship Division Two this season after no fewer than six scores of 90-plus by team-mates. Porterfield received good support from Alex Gidman (40) and James Franklin (50 not out) as Gloucestershire recovered from the early loss of Jonathan Batty. Matt Mason was the pick of the Worcestershire bowlers with three for 68 off 23 overs. After Batty's miserable season with the bat continued when he was lbw to Mason for a single, heavy rain threatened to wipe out the day's play with the home side on 6 for 1. But an early lunch was taken and only nine overs had been lost when the match resumed at 1.10pm. Hamish Marshall helped Porterfield take the score to 52 before fending at a delivery from Mason that bounced more than he expected and was well taken at first slip by Vikram Solanki. Porterfield demonstrated his growing confidence by lifting Alan Richardson over mid-wicket for six but he had a life on 31 when Daryl Mitchell spilled a difficult chance above his head off Mason. The Ireland captain gathered momentum and moved to 99 with a third pulled six, this time off Shakib Al Hasan. The following delivery brought a sumptuous back-foot shot through the off side for a boundary and a century off 118 balls, which also featured 13 further fours. 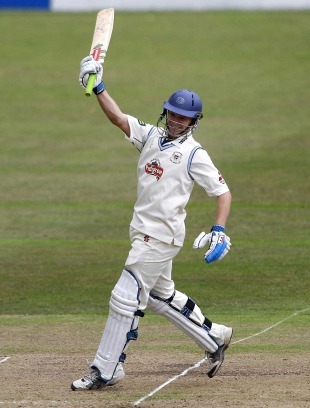 It was clear to see what the ton meant to Gloucestershire as a team. Batting partner Gidman raised both arms with clenched fists as if he had got the ton and then embraced Porterfield in mid pitch. Gidman contributed well as the hosts added 120 in 30 overs for the third wicket before he got a good one from Mason to give Solanki his second slip catch. That was 172 for 3 but Franklin soon joined Porterfield in putting on some of the most attractive batting of the day. The New Zealand allrounder hit a glorious straight six off Moeen Ali and looked in excellent form. That also applied to Porterfield, who reached 150 off 199 balls and then reverse swept Shakib for his 23rd four. On 39, Franklin benefited from a missed stumping as Ben Cox failed to gather the ball when he was beaten by Moeen. Porterfield then hit his fourth six to beat his previous best first-class score of 166, made for Ireland against Bermuda in a 2007 Inter-Continental Cup match. He looked on course for a double hundred when miscuing a ball from Shantry to mid-on where Mason took the catch. It was the 209th ball Porterfield had faced and his final boundary count was 26 fours and four sixes. Franklin's fifty was brought up in 122 balls, with four fours and a six.